Asheville North Carolina retirement communities rank near the top on most active adults' lists of best places to retire. People who are 55+ (plus) have heard about its great location in western North Carolina near the mountains, its reputation as a livable city, as well as its many other charms. Thousands of active adults are moving here to see for themselves. Updated Dec. 2016. Asheville retirement communities of every description have either been built or are under construction in this area of the Blue Ridge Mountains in western North Carolina. Many of these developments are built around golf and/or lakes. Downtown Asheville has a comfortable feeling where walking around the town is a pleasure. It has a great collection of art deco architecture, antique stores galore, and a variety of art galleries and boutiques. The stylized details found in Asheville's early art deco and gothic buildings echo the prosperity of the 1920's. There are also outdoor cafes spread throughout downtown. Active adults looking for retirement information on Asheville and 450 other active adult communities will find it here at Topretirements.com. 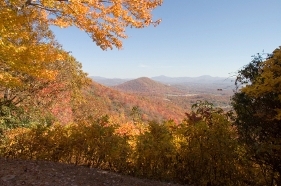 The Asheville NC community profile features helpful information and links, plus ratings on expenses, age restrictions, taxes, recreation, amenities, transportation, and security. In the Asheville retirement Forum you will find discussions where you can ask questions and post opinions. Don't overlook other communities near Asheville either, which are also very attractive places to retire. These towns include Franklin, Brevard, and Hendersonville, among others. You can even download a Free eBook, "The Baby Boomers Guide to Selecting a Retirement Community", or sign up for our Free retirement community newsletter.